Leif Segerstam Interview with Bruce Duffie . . . . . 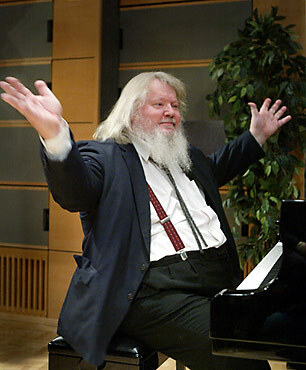 When you come face-to-face with the Finnish composer-conductor-pianist Leif Segerstam, you are convinced he is Santa Claus. The complexion, the round belly, the jolly laugh all are straight from the storybook and every visual reproduction of Saint Nick. And in a very special way, like Santa, Segerstam has a very global vision of music — his music — and how he expects performances to reflect these ideas. He was in Chicago during the last month of 1997 to conduct a program that included one work from his own imagination called February, which is performed without conductor. For this, he was at the piano — not as a soloist, but simply embedded in the orchestra. The music started apparently on its own, then moved along quite naturally, and everyone seemed pleased at the end. His English was rich with allusions and unique word-play. Much of this has been left in the text, so it might take a couple of times through some phrases to really understand what he is driving at. But it’s well worth the extra effort, especially when you picture this exuberant and joyous bear of a man conjuring up images the same way he paints expressive musical pictures in sound. While setting up the recorder, we were talking about various musical subjects, and I wanted to examine something he said . . . . .
Bruce Duffie: You say that no two performances of a piece are ever alike. Is that true only of the new music, or also of the old music? Leif Segerstam: All my free-pulsative [freely pulsating] music has this capacity, that it can adjust itself to the “now” point of the real now, when the now is there! BD: So music is now? BD: So all music relates to all other music that has come before? LS: Well, yes, at least when it is born. Actually music is always reborn when it is relived in the performing moment where you have to do the tricky thing of making it sound so as it would be really what it should sound when it sounds, which actually is not the sound, but the motivation for why the composer tried to catch this in some kind of a notation. If you try to catch it in such a notation which I use, there is a flexibility of adjustment to situations and to feelings or chemical substance of people that are not yet born, because maybe people will understand my free-pulsativity better after twenty-two or forty-four or eighty-eight years! BD: You want people to understand this better in the future? LS: Well, in moments when I get comments where I see that somebody actually didn’t see the richness in it, then this is my hope, that time will show, like the piece February that we just played here in Chicago. The way it has got under the skin of the great musicians of the Chicago Symphony, that’s very rewarding and very inspiring. The way they handled it on the second concert was different and more coherent and more understanding of the richness of this. You have the option to choose the right moment to give birth to musical material, which you don’t have to find out yourself. It’s not an improvisation, but it is another sort of interpretation than the usual music which is measured with measured bars, and with conductors pointing that now, now, now, you shall, or it is the right moment. In my notation it is so that those that have the responsibility of giving birth to the sound have the option, in the spur of the moment, to adjust the decision of shall I now or shall I wait a little bit before I give birth to it. It’s not binary computer reaction, but a ternary to do so or so, but different so’s, or wait until ready to make the decision. BD: It sounds like you put an awful lot of trust in the musicians who are playing your music. LS: Well, yes. I trust my material, too! [Both laugh] I usually try to make a resemblance to how you build skyscrapers in Tokyo or in Los Angeles, where there are earthquakes. There should be a flexibility in the construction so that if the earthquakes come and shuttles the thing, everything shivers, then all right. The toilet can move a little bit to the left and the kitchen can move a little bit to the right and the living room also will change a little bit in place. Maybe the skyscraper is a big S, but it is still a skyscraper and we have very beautiful rooms still intact! 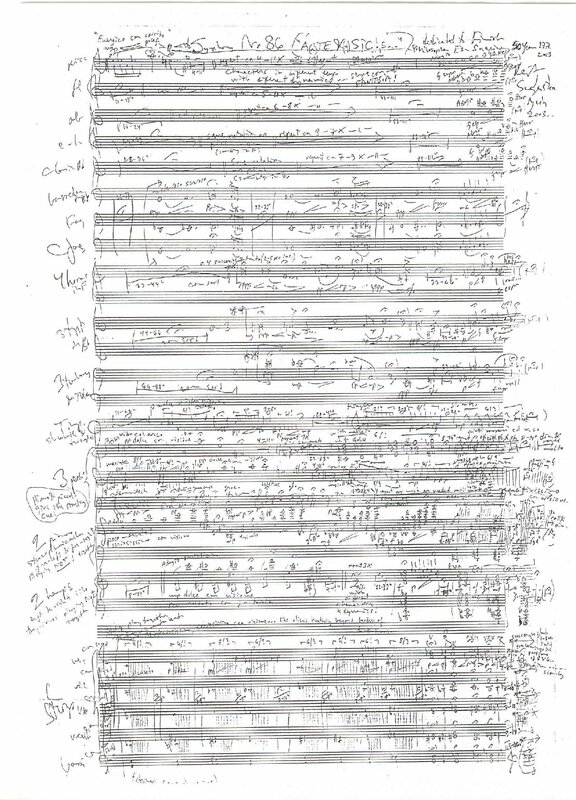 [Laughs] This is the way that my score pages are; the things that are on these pages can be put a little bit left or right in time and still make sense harmonically. How I find these kind of Lego bits I can’t explain, but I hear it that way. BD: When you’re working with the score and putting things down, does it make any difference as to where they are on the page? LS: Well, not very far left or right, no! But in my notation, if there are silences or pauses between making music for the musicians, then it says, “Wait eight to twelve seconds.” Or for the brass, for something that is going to be significant and very loud and overpowering, there could be, “Wait forty-four to sixty-six seconds, or sixty-six to eighty-eight seconds.” It is not relevant that it is exactly forty-four, or forty-five, or sixty-six, or sixty-five, but it is a longer pause until you trigger that kind of sound. It’s like having a battlefield, that you’ll take the artillery later. It is the strategic planning of a sounding event, which is from one start to another. My scores have in-built conducting mechanisms. February had six; the first was the percussion slapstick together with the concertmaster, and then everybody knew that now the piece started; let’s play the first portion until letter A, where then the next trigger for everybody to recognize was sforzando in the double bass. And the double bass had to wait for everybody to finish, except those that didn’t have a pause at the end of that portion of the music, and that was the pianists and some of the percussion. The double bass knew that and waited, and had the nerves to wait, and then he did his growls. Then everybody knew another portion, the second portion had started. The third portion was triggered by an arpeggio harp chord. The fourth was again the slapsticks in percussion, and the fifth was the piano pillar sounds of thick D octaves. The last triggering, or opening key to one of these windows, was the piccolo with a little squeak there, toodle-oo! Then everybody knew that we were there. The portions were around three minutes, and exactly-notated portions of music then have the quality that they would fit in even if they are a little bit left or right in the time. But this handled by sensitive ears of the musician which hear before he plays. He hears the notation. He knows how he is going to sound when it sounds. If we take how woodwind solos should react, then it is not wise to start a woodwind solo if a trumpet has something very overpowering! Wait until the trumpet has said his thing, or is taking a breath. Then you start your thing. It’s like a herd of animals trying to cope with a small waterhole, to get drinking space. It’s very natural. Or it’s like the trading pits on Wall Street where they have to get the attention to indicate yes I want to buy this; you have all these kind of finger techniques make trades and so on. BD: But the piece didn’t seem that frenetic, though. BD: It’s not too jarring to play a piece called February in a very warm climate? LS: Yes, but in February, the Finns are fleeing that thing, you see. Everybody in the Canary Islands knows that the Finns come, so this is the right place to show what the Finns are going away from — like greetings from the north in the language of music, which has no boundaries. When listening to my piece, I think that somebody can see that maybe everything has music in itself — even wooden landscapes or mountains that we feel have no soul. And what is the language of their soul? Maybe it is the only language to which you could translate with some kind of great fantasy that which all these granite rocks deep in the souls of dark forests are actually hearing or singing or screaming primally. During this cold time, it is, in a way, a primal scream in their subconscious, if they have such a thing. This is what I am fantasizing! BD: Do you feel that music is the universal language? BD: You’re very much into the electronics, and into twentieth century life. LS: Well, I am just trying to get you on the level, because I guess you are, too. I am not so much. I use pencil when I scramble my scores and I write them direct. I very seldom have to use the eraser. BD: When you’re scribbling with the pencil, are you always controlling where that pencil goes, or do you find sometimes that the pencil is leading your hand across the page? LS: No, because this is what computers do. If you trigger them, they’ll do more than just this one push of the button nowadays. My pencil is writing only what I hear, and I give it the time to do the mark. Even if I have written very, very many notes, my enemies say that it’s too much! [Both laugh] But I then always say that nature is very generous. To get one child, there are millions of sperms! I have found that actually it’s paradoxal. You have to learn to be slow enough in order to produce so much notation as I am producing. You have to be able to think in slow motion because your hand is not that quick that it would write [makes a grand sweeping gesture] zoop! And the page is full. A page like this takes two minutes or so to perform. It is rather slow motion for the hand to notate all these hundreds of notes that in a hundred-piece symphony orchestra score will happen on one page. BD: Would you be happier if you could write and notate in real time? LS: Yes, just print out things that you have in there! I woke up many mornings and had symphonies ready! But then to start to scribble it down, that takes time. BD: You’re both a composer and conductor. How do you divide your time, and how do you divide your mind between those two activities? LS: It’s a positive schizophrenia, really, so it’s interesting to use this dualism positively. It is actually very easy to understand that they do load the batteries of each other. What a fantastic feeling for a conductor to have a score page where there is no notation that he has to obey or scrutinize to find out the enigma of why that other composer notated this way! Why or how shall I be able to find the key to the enigma? It should sound like it sounds when it sounds, which was present before he did the capturing in notation. BD: So you feel closer to other composers because you are also a composer, even though you’re conducting their music? LS: Yes! Yes, I think that I can actually have easier access to what is between the lines or behind the notation because that of it. We all carry around our own life score, a life partitura which gets richer and richer depending on what happens around you, or what you participate in, or your experiences. I am now talking about not musical, but life experiences. How close you came to death sometime; life and death, or love and hate, or blood, sweat, and tears! All these attribute functions that are making memories in our life score that we can take out. They burble up sometimes in flashbacks when needed, because we have quite a bank up there of mental power or natural powers to cope with different situations. BD: It seems that you are a better conductor because you’re also a composer. Are you a better composer because you’re also a conductor? BD: When you’re conducting a standard work, or even a new work, do you get all of your work done in rehearsal, or do you leave a little bit of spark of improvisation for the performance? LS: It depends on how many rehearsals I have, because usually you are never ready no matter how many rehearsals you have. But I don’t intentionally leave anything out. I am trying always, as quickly as possible, to get as good a result as possible. But overnight, or after the general rehearsal, if you go and sleep and are really alert and in good iridescent mood, then things will happen in the performance. You just have to live professionally, eat and drink well and sleep before the performance. Then you are fresh and things might come out, with good angels behind you, to something unique. This is what we all hope to be capable of doing every time. If I take a Sibelius symphony or a Mahler symphony or Neilsen, every performance has some new “aha” experiences. I think, “Oh, no! This is the way it should have been,” or, “I had never thought this.” It falls into place just differently, because that’s love and nature. I think that nature is constantly seeking possibilities for mutation even if I am not a Darwinist. It is interesting to be open for new ideas, especially if you work with a soloist. Then you should try to be a good accompanist in the way that you adjust to how he or she then is thinking, and not be so much of a tyrant. BD: Are you an accompanist or are you a collaborator? LS: I think I am a good accompanist, but collaborator is a good word. I hope I am that, yes. LS: Well, for that time being, yes. You should be satisfied, because this is part of what nature allows. If something feels good, you should let it feel good! I have felt good many times, and I also felt not so good. BD: But then the next performance you can feel even better... or is it just different? LS: Well... [Laughs] For some of these great works, if we have a series of performances where I have been feeling very good, then with the time perspective I listen to it on tape or see it on video if it was a televised concert. Before I do it again, I see how I did it last time, and then just react to it objectively. I see that it could be better or it could be richer, or oh, I missed that! The self-criticism is very good to take. So this is what I usually do if I have saved a cassette because when you listen to music, you are a listener; when you perform, you are a performer. There’s no schizophrenia in that one, like conducting and composing. But as a conductor, beside being an ambassador for the composer, you are also a representative of the listener. Your place is the most strategical one, and you have even access to do something about the actual sounding of the performance. But the conductor’s baton has no sound! So you are a listener, in a way, even if you make the music. There it is good if you can throw away your ears and be very far away in order to understand, even though you are very close. BD: You, the conductor, must be a little part of the audience? BD: Now we’re getting into the era of electronics. Should the audience participate in the control and adjustment of the piece of music? LS: Well, not in the way the symphonic orchestra is performing now. But if we had synthesizers and computers instead of living people there, then, like in the House of Parliament, the listener could have some kind of access with fingers or electrodes to the mind to control the sound. Perhaps they would like it to have the attributes of Carlos Keliber or Lorin Maazel; or if they don’t want Karajan, they could have Solti. And somebody might even remember Segerstam! [Both laugh] [See my Interview with Lorin Maazel, and my Interviews with Sir Georg Solti.] Then somebody could analyze the bulk of our attribute function — how we cope with different styles of music — and then when you are sitting there, you could simply wish more of this or that. But this will be a squirrel’s circle, or mousetrap if it goes too far. I am kind of a Green Peace for live performance and want to let it be like it is because the mysticism of communication in resonance with music as it is happening. Not with the actual sound, but simultaneously with the sounding there are great communications going on between people in the audience, and the performing entity. BD: So then as you’re conducting, you are reacting to what you feel behind you? LS: No, but I know that there are millions of nerves focused on what we are doing. I can say that I feel them in the atmosphere, but I would be lying if I say that I really read them and that I would actually react to them. But it is stimulating in the applause or in the bravos or in the screams; that’s good to get. And if you get the boo, it’s really terrible! [Both laugh] In some German opera houses, it’s fancy to boo even if the performance is great. There’s always somebody that wants to shout a boo to hear and see how will people react. BD: It seems rather inappropriate, though. LS: If it was good, don’t scream boo just to be individual. That’s terrorism! LS: [With a matter-of-fact tone] Oh, I thought we answered that — communication. BD: Communication. Period. Just like that? BD: Communication of the composer to the musician or to the audience? LS: No, no, I think in nature, the big, the cosmic thing is talking through us. In some way, actually, the composers are therapists. They listen to nature, and nature is giving their session. We give nature the time to release the tensions into what we capture from nature. We’re just tools, really. BD: So we shouldn’t call them concerts, but rather we should call them therapy? LS: I don’t know! I don’t own the tones. They are the same tones that Wolfgang Amadeus Mozart also borrowed for a while and did his constructions. I don’t say that I own the tones, but they speak through me in the constellations that I have caught into notation. I then give them further flexibility in my notation for the great performers to react positively and creatively in the broad “now” point — like the Chicago Symphony has done in my February — so that I will live on this experience a long time and probably produce very many new constellations just from the joy of how it worked! So nature will speak next summer. I never answer the question “when do I compose?” I don’t take time, because if you take time or make deadlines, you won’t get anything done. I try to zero in on the times that I get myself free from conducting, when I don’t have contracts to conduct, and this I try to do in the summers because the summers are fantastic. I have just to wait. Is something coming or is something not coming? If it’s coming, I note it. If not, then I just take sauna and swim and live. Life is a great score to interpret, too! BD: You’ve written quite a number of scores, so obviously the muse hits you quite a lot. LS: Usually in the summers. You can’t compose when you conduct, that’s for sure. If I have a day between two performances, I couldn’t do anything there. It’s then better to learn new scores, or listen to something if you want to do music. But I think between two performances you shouldn’t take any music; you should do something else to get the richness of your life, to get something that will motivate tomorrow’s day on the podium again! BD: You conduct both concerts and opera. Is there a big difference between conducting a concert and conducting an opera? LS: It is good to do both because they give motivation and energy to each other. To make it through a symphony concert, you have to have the dramatic nerve that you get from doing opera. It has to be natural with you. Then that gives sparkle to the whole of a symphonic event, even if there’s no libretto for it. The continuity, the thread might benefit from that dramatic sense that you have when you are doing operatic things. Then again, in opera business, many times you have to swallow compromise, because there is not enough rehearsal or because it is so complex. There, the discipline that you get from working a symphonic program can benefit your working with the very complex machinery which is an opera. BD: Have you written an opera yourself? LS: Yes, it is really, but it is because I haven’t got the right libretto. A libretto should already be so fixed that I have the words and the strategy and all the setting. I need another mind that has figured out, “I just need music for these words.” If somebody gives me this package, I think I could do a rather quick composing process to get that to be an opera. But I haven’t got such ready-made packages yet. BD: I hope that one comes your way. BD: I can’t imagine an Aku Aku statue next to Michelangelo’s David. LS: No, but maybe the Eiffel Tower or the Statue of Liberty, if they dance! [Laughs] Or the mannequin piece together with the mermaid from Copenhagen! Think about what all these statues have seen when people have watched them, or how they felt. We also don’t know what actually the Aku Akus have seen, and why some of them are with their backs towards the sea. I have written a symphony, Visions From Rapa Nui. My twentieth symphony, December, is where I fantasized that I have read what is inside the mind of this. There’s one place where there are seven of them, and the bird that opens the head is an E-flat clarinet. Out comes the music which was there, triggered one, two, three, four, five, six, seven. And there’s male chorus which is singing on the language of Rapa Nui, Rapa Nuiska, which I invented! I have heard Visions Number One and Seven in a Christmas concert with the Swedish Radio Choir, which is one of the world’s best choirs, and the Swedish Radio Symphony Orchestra. So I have heard part of my Twentieth Symphony. That was two years ago, and it was called December because I was there in December. I intend to go to the Christmas Islands in Easter time! [Both laugh] Vice versa! BD: You’ve mentioned a word of couple of times that I want to pounce on and ask you about it — greatness. What is it that makes a piece of music great? LS: If it stirs up rich feeling, you can’t verbalize it but you feel that it is there. Your hairs get stiff and electricity is in the atmosphere at that time when these vibrations clash. It’s a complex harmonic happening, and probably it is possible to analyze mathematically. But when it happens in my free-pulsative scores, then it is easier to feel it like a wonder. BD: So that’s what music is — a wonder? LS: Yes. The human being is in front of nature and is forced to think that it is a wonder and that we are part of such a greatness; our mind can get so far without going there, just by imagining it. BD: Is there a spirituality to your music? LS: It would be nice if you feel so. If my music could get people on trips that took them to things that they couldn’t have imagined they could touch, and if my music could get such a string pulled, then there’s a motivation for my music, isn’t there? I want to be generous, as generous as nature is! Nature gives me this. I listen to the materials of music, and I feel the trembles when I hit something that I feel went into those kinds of places. BD: And you share this with the people? LS: Yes, and when it’s done again, you get the thrill of knowing that I don’t lose this, that I have found something! You’re like a scientist, or explorer, really! BD: You’ve given birth to most of your compositions. Have others conducted your works? LS: These works don’t need a conductor. BD: But the ones that do have conductors? LS: Not very many. That is the truth. Esa-Pekka Salonen did one, and he did it very different from what I had done, but it was very stimulating. It was the Orchestral Diary Sheet, Number 25. From my earlier works, in the seventies, the Patria was conducted by many other persons. BD: I just wondered if this gives you a sense of satisfaction, knowing that others have taken up your work and have shaped it themselves. LS: Yes. I am very happy, but it has not happened very much because people are afraid of my notation. That’s why we talked about it. It will take time and I don’t mind. I go on doing this and I’m happy if I hear it once. If it is bad, then I know it’s bad, but if it’s good, it gives me strength of going on. What I heard of February was really rewarding, the way Chicago Symphony played it. And now when we are making this interview, I still have one concert left, and I am looking forward to Saturday night’s concert. BD: I assume that you look forward to everything. LS: That belongs to the profession! BD: Good. One last question — is music fun? LS: There are different kinds of music, but some of the music is fun. We are also asked by the notation to have fun with music — if it is a humoresque; in many scores it says “mit humor.” Also in some places in Gustav Mahler. Joy is another thing and very much of music is actually enjoyment. Music is a stimulus, so it can substitute for drugs, really. Yeah, that’s a good thing. BD: Do you like wandering all over the world with your music and others’ music? LS: Yes. I learn when I am around globally. But I am getting older, so I am also going to run out of time to listen to nature. If I wander, then I cannot write and I have wandered so much that maybe it is better that I make a journey inside myself rather than outside, and listen to the possibilities of the humanity of which also I am a part. BD: I’ll be very interested to see where that inward journey takes you. LS: I have been there for every score, and so it deepens. BD: Thank you so much for coming to Chicago and bringing not only the other music, but your music, too. LS: Thank you! Thank you, it was a pleasure, really. Leif Segerstam is now Chief Conductor Emeritus of the Helsinki Philharmonic Orchestra in gratitude for his supremely successful period as the orchestra’s Chief Conductor for 12 years between 1995 and 2007. 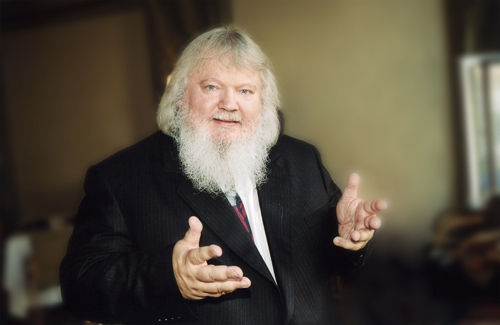 In addition he holds honorary titles with the Danish National Radio Symphony Orchestra and the Staatsphilharmonie Rheinland-Pfalz in Germany. He has also held the position of Chief Conductor of the Austrian Radio Symphony Orchestra in Vienna and of the Finnish Radio Symphony Orchestra as well as having been Music Director and Chief Conductor of the Royal Swedish Opera. 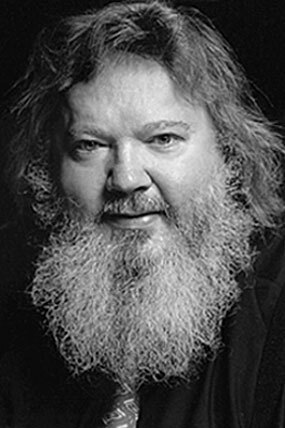 Leif Segerstam, born in 1944, is one of the most versatile and interesting musical talents from the Nordic countries. From 1953-1963 he studied violin, piano, composition and conducting at the Sibelius Academy in Helsinki and then continued with a postgraduate course at the Juilliard School of Music in New York. He began his conducting career with positions in the opera houses of Helsinki, Stockholm and Berlin with guest appearances which have included the Metropolitan New York, La Scala, Covent Garden, Teatro Colon, the Salzburg Festival and the Opera Houses of Cologne, Geneva, Hamburg and Munich. He is a frequent conductor at the Savolinna Festival. 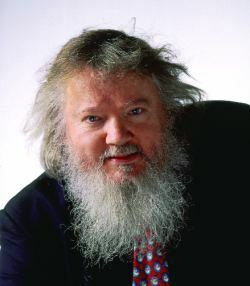 The numerous recordings made by Leif Segerstam are recognised by critics and public alike as outstanding amongst modern interpretations. They include the complete symphonies of Mahler, Sibelius and Nielsen in addition to several works by contemporary composers with the Danish National Radio Symphony Orchestra, Scriabin and Schnittke with the Royal Stockholm Philharmonic Orchestra, Brahms with the Staatsphilharmoinie Rheinland-Pfalz plus Reger and Alan Pettersson with the Norrköping Symphony Orchestra. Leif Segerstam has shown exceptional creativity as a composer throughout his musical career and has over 200 symphonies, 29 string quartets, 11 violin and 4 piano concerti as well as chamber and vocal music. In 1997 he made his débuts in North America with the Los Angeles Philharmonic, Toronto Symphony and Chicago Symphony orchestras. The 2000/2001 season saw his third visit to the Chicago Symphony Orchestra and his first appearance with the Detroit Symphony Orchestra led to an immediate re-invitation and a European Tour with them at the beginning of the 2001/2002 season. 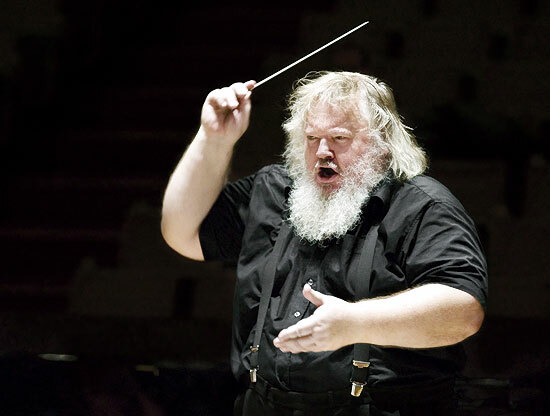 Since Autumn 1997 Leif Segerstam has been Acting Professor of Conducting at the Sibelius Academy in Helsinki. 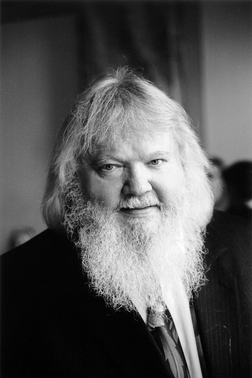 He was the winner of the 1999 Nordic Council Music Prize for his work “as a tireless champion of Scandinavian music.” In 2004 Leif Segerstam was awarded the annual State Prize for Music in Finland and in 2005 the highly esteemed Sibelius Medal. This interview was recorded in an office of the newly-renovated Orchestra Hall in Chicago on December 5, 1997. Portions were used (along with recordings) on WNIB in 1999, and on WNUR in 2009. The transcription was made and posted on this website in 2009.